Time to spotlight a site we REALLY love. Michael and Dina, you look marvelous. Click the pic to get to the photographer's site. 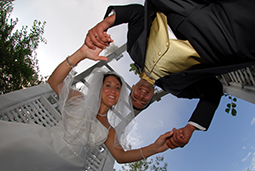 We were contacted recently by Ida of Al Ojeda Photography in New Jersey. We checked out their site, and, well…wow. What do we love so much about Al Ojeda Photography? The way they catch people in the act of being funny, fun, gorgeous and themselves, while maintaining a truly professional shot. Oh, and hey, guess what. Other people seem to love them too! Just beautiful. They cover the New York tri-state area (New York, New Jersey and Connecticut). So give them a call and let us know what you think…and as always, send us your favorite shots so we can ooh and ah over your special day!